Learn some interesting information about New Zealand while enjoying a range of fun facts and trivia that's perfect for kids! Read about New Zealand's tallest mountain, its population, major cities, islands, exports, animals, popular sports and much more. New Zealand is located in the south-western Pacific Ocean and features two main islands, the North Island and the South Island, as well as other smaller ones. Other smaller islands include Stewart Island, Waiheke Island, Chatham Island, Great Barrier Island and more, although many are uninhabited. The capital city of New Zealand is Wellington while the largest city is Auckland. Other major cities include Christchurch, Hamilton and Dunedin. 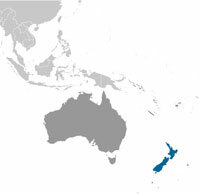 The population of New Zealand was estimated to be around 4.5 million at the start of 2013. The official spoken languages of New Zealand are English and te reo Maori, with English being the most widely used. Maori are the indigenous Polynesian people of New Zealand. The Maori name for New Zealand is Aotearoa. The Treaty of Waitangi was signed in 1840 between the British and Maori, making New Zealand a colony of the British Empire. In 1893 New Zealand became the first country in the world to give all women the right to vote. Due to its isolation, New Zealand has developed unique animal and plant life. Located in the South Island, the highest mountain in New Zealand is Aoraki Mount Cook which reaches 3,754 metres (12,316 ft) in height. Dairy products are New Zealand’s highest earning exports. Rugby is the most popular spectator sport in New Zealand but a variety of sports such as football (soccer), cricket, netball, golf and others are popular among participants. For more information, check out maps of New Zealand or take a closer look at the New Zealand flag.